As expected, today Apple unveiled its overhauled News app with a shiny new subscription tier titled Apple News+. For $10 per month, you’ll now be able to side-step paywalls and get all your magazine, newspaper, and web content in one centralized app. In terms of design, the News+ app is slick. For example, it’ll include GIF-like “Live” magazine covers and an intuitive swipe-based interface. The articles are laid out quite handsomely. It’s available starting today, provided you update the News app, and to readers in the U.S., Canada, U.K., and Australia. Though, Canadian subscribers will have to pay $13 per month. Selection-wise, the announcement was pretty heavy on magazines. That’s probably because last year, Apple acquired the Texture app. 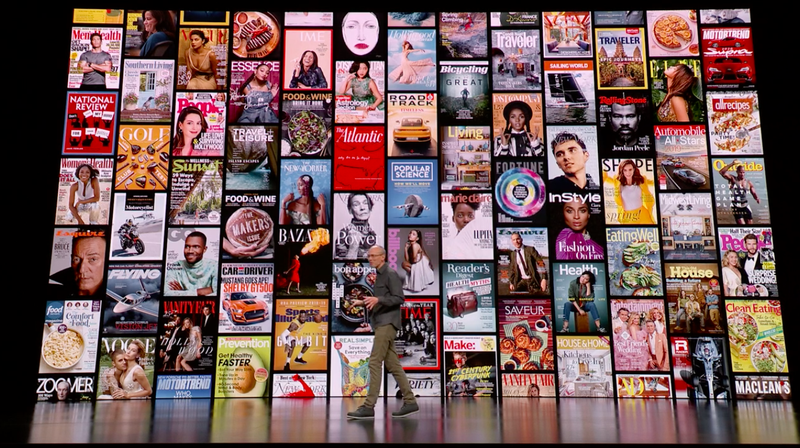 At launch, you’ll be able to access over 300 magazines, including major titles like Time, Vogue, People, National Geographic, Popular Science, Billboard, the New Yorker, Sports Illustrated, Fortune, New York Magazine, and Variety—to name a few. Subscribers will also be able to access previous and current issues of magazines, as well as individual articles. That’s not to say newspapers and online publications are out of the mix. Apple News+ will also include the Wall Street Journal, the Los Angeles Times, and the Toronto Star. It’ll also include theSkimm, the Highlight by Vox, Vulture, The Cut, Grub Street, and Extra Crunch from TechCrunch. Apple also made sure to emphasize at the event that whatever you read will be private. Basically, advertisers won’t be able to track you because neither Apple nor publishers will know what you’re reading. Just how Apple will manage that (Anonymized reader data? Locally processed content recommendations, perhaps?) wasn’t made super clear, but it tracks with earlier reports that publishers wouldn’t be receiving any type of subscriber data for participating in Apple News+.